It has become very popular among climate science deniers to say that “the science is unsettled”, as if such a statement settles anything. It doesn’t. Of course the science is unsettled. Science is almost always unsettled. That’s why they call it science instead of religion. But just because scientists don’t know everything doesn’t mean they don’t know anything. There’s still much they don’t know about global warming, just as there’s much they don’t know about cancer and Pluto. That does not mean they’re uncertain that any of them exists. “Settled science” is a straw man suggesting that scientists claim to have all the answers. How could they when they usually don’t have their own radio talk shows? And I’ve never heard one of them claim to know everything. What you might hear them claim, however, is that they know more about the field they work in every day than does someone who’s never worked in it at all. Fancy that. 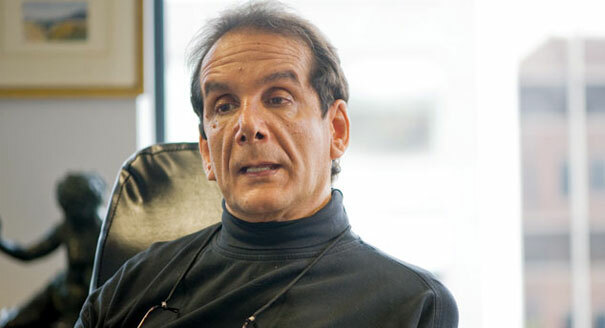 Charles Krauthammer (pictured) recently paid tribute to the “settled science” decoy with an article in the Washington Post titled The Myth Of Settled Science. He prefaces his remarks with the insistence that “I’m not a global warming believer. I’m not a global warming denier.” But he certainly uses the tactics of a denier, including cherry picking, misinformation and distortion. And he follows the Golden Rule of today’s rabid ideologues: When All Else Fails, Attack President Obama. There is nothing more anti-scientific than the very idea that science is settled, static, impervious to challenge. Scientists, of course, subscribe to no such credo, nor does Obama. He didn’t say that the science is settled, but that the debate is settled — i.e., the debate over whether global warming is a fact. And on this point he was all too accurate. The debate indeed has been long settled among competent and disinterested scientists. Plenty of people still contest that conclusion, of course, just as plenty of people contest that a landing on the moon really occurred. But neither is really a debate in any meaningful sense. Are scientists sometimes wrong? You bet. But that doesn’t mean science itself is wrong. And you need a lot more to establish that scientists are wrong than ideological fervor and cherry-picked details. Krauthammer can speak with some authority about mammograms, having been trained as a physician. But to the best of my knowledge, he has little to no expertise in climatology. Which doesn’t seem to make any difference to the cult of denial. It’s interesting to note that Krauthammer is generally considered a “conservative” — which may not be entirely fair, since he holds certain positions (i.e., pro-choice) that are antithetical to contemporary boilerplate “conservatism”. But he is a regular contributor to Fox “News” and The Weekly Standard. And he certainly follows the winger playbook on this one. “Conservatives” — whether they’re genuine conservatives or modern neocons fraudulently wearing the badge of conservatism — have a long, long history of being on the wrong side of science. You’d think that just once in the long, long history of the human race, they could get it right. But they seem very, very determined not to. One reason deniers are so infuriating is that, they accuse others of unethical beliefs even though their own side of the street is littered with exactly the same garbage that they accuse scientists of using. In that regard those like Krauthammer are truly hypocrites, as well as those other conservative pundits who project their own analytic defects on the facts and people they deny. It is becoming more and more clear that this lame type of turning tables must come straight from the playbook of ALEC and all the other conservative think-tanks who are busy confusing the differences between night and day. They are not playing the role of prudent skeptics. They are playing the role of actively defending the future of big oil and big coal–as they try to skewer scientist for engaging in some kind of fantastic plot, which does not really exist! The fact is that Scientist are just as certain about the causes of global warming as they are about the existence of gravity. They may not understand every last detail about this natural force, but, they are certain it exists and knowledge about it is what has enabled us to pilot the Apollo moon missions with the help of Sir Issac Newton. In regards to global warming they are also supported by thousands of independent and peer-reviewed studies which clearly implicate we humans as the main drivers of toxic Co2 levels. Its so absurd to think that many people who are not knowledgeable about climate science or of science itself, want us to believe that they are more qualified to expound on the subject, then tons of PhD’s who have dedicated their lives to understanding this immanent threat to mankind—several of whom are even Noble prize winning laureates, and have no need or ability to do research for the sake of making millions in research funding—funding which does not go as extra pay to them, but rather, to covering the expenses of extensive research like, lab equipment and experimental costs. The only extra pay they get is received only to augment the money they have forgone from teaching and lecturing etc. while they must suspend these activities in order to conduct research. Although there is no doubt that having PhD’s helps them to have a good income, the motives for their research have nothing to do with merely increasing their bank accounts.The hype deniers expect us to buy is equivalent to seeking out plumbers, carpenters and accountants to preform brain surgery on us, just because brains surgeons do not have complete knowledge of how the brain works—thus leaving deniers free to believe that these less educated people, who are not scientists, have superior knowledge of something they actually have very little, or no knowledge about, at all! The sad part of all this denial and hype aimed at delaying political actions, is that if oil industry minions succeed in spreading their BS, ultimately we all will be losers—even them! Mammograms do NOT prevent breast cancer-they only detect. With global warming, we do not conclusively know if man made global warming is happening or whether it’s natural. Temperature changes have happened over time-is it caused by greenhouse gas pollution or is it natural which have happened over time is unknown. But whether or not greenhouse gases cause global warming, there is something people can agree on-getting rid of pollution is a good thing. How can we get cleaner energy? We must use nuclear power, hydroelectric dams, geothermal and in some cases use renewables. But renewable energies which will be explained is not so green as it’s sold and renewables can do environmental damage. We must reduce our use of natural gas and coal and save these fossil fuels. Germany is building many coal plants to replace their nuclear powerplants and importing gas. Germany will be getting dirtier air from their coal plants.Windmills and solar panels, are sold as ‘green’, but they are not. They need more land, use more materials, generate less energy-both the wind and sun are intermittent. Windmills have killed endangered birds and bats. People who live near windmills have higher incidence of hearing loss, migraines, nausea, etc. Solar panels have dangerous chemicals some of which are carcinogenic. Yes, we must also use windmills and solar panels when possible, but let’s end the idea that windmills and solar panels are ‘green’. Windmills and solar (renewable energies) are based on how much sun and wind you get and when renewables don’t give enough, then coal as Germany does is used. The main thing here is that we must save fossil fuels such as limiting natural gas to fuel cars and reduce coal usage. That’s why we must use nuclear/atomic power, geothermal and hydroelectric dams (when possible) combined. Nuclear/atomic energy has advanced greatly-they already use less Uranium which lasts longer & more energy. Thorium needs to be perfect. Physicist Kirk F. Sorensen is working to perfect the Liquid Fluoride Thorium Reactor. It must be said that people like me who support nuclear/atomic power also support geothermal, hydro-electric dams, etc. If a place can get 100% of it’s energy from hydroelectric dams as some places in Canada do, then those places uses hydro-electric & the need for nuclear is not there. If a place can get 100% of it’s energy from geothermal as Iceland does, then again, the need for nuclear/atomic energy is not there. Please know that those of us who support nuclear energy also support hydro-electric dams, geothermal, etc. We must use atomic/nuclear energy as well and know that there I am an environmentalist who supports nuclear energy. How your analogy regarding mammograms and global warming make sense, I have no idea–mammograms detect breast cancer, just as the temperature of ground stations and orbiting satellites detect global warming. And, scientists know full well that heating has occurred at other times during geological history—its the rapidity of the current increase in temperatures that has scientists worried. This rapid increase, is happening faster than at any other time during the last previous millions of years! Yes, getting rid of pollution is something most of us would agree on. And, there is truth to your observations that many renewable forms of energy are not (completely green) But neither are nuclear power plants which must be built at considerable expense due to the manufacture and distribution of many constructions materials and human labor needed to build them–and these activities often require burning coal and oil. Nuclear plants must also be built with adequate safeguards that prevent beaches in the cooling areas that can lead to the expulsion of dangerous radiation into the surrounding areas–as happened with the Fukushima plant in Japan. They also necessitate strategies for disposing of dangerous radioactive materials, having hundreds of thousands of years in half-life rates. There are possible drawbacks to wind and solar, some of which you mentioned, but there will always be drawbacks to overcome with any widely used forms of power. Most scientists see great value in these two forms, since the power of the sun and the power of the wind are virtually inexhaustible and pose less of a threat, than coal, oil and nuclear. The science about global warming is as certain as possible since most of the three percent of scientists that do not recognize it, work for big oil or conservative think tanks that exist to support the dominance of coal and oil. Scientists will never bestow absolute certainty on any of their findings since they know that the possibility of changed data that causes different conclusions will never be completely absent. But as far as the primary causes for global warming happening as the result human activities being true, they are just as certain of that, as they are that gravity exists—and even that doesn’t rate an absolutely perfect 100 percent either! We need to expand nuclear/atomic energy & focus on smaller reactors which can be put underground. Smart energy policy requires we use nuclear/atomic energy, hydroelectric and geothermal prudently. All the energy sources including geothermal have their advantages and disadvantages. That is why as known, we have environmental impact studies before a hydroelectric dam, nuclear powerplant, etc. is built and the engineers, physicists build according to this. Nations such as China and India are building hydroelectric dams + nuclear powerplants. Patrick A. Moore of Greenspirit believes that both nuclear powerplants and hydroelectric dams are what must be done to get cleaner energy. The USA does not have the geography to build any more hydroelectric dams-Canada, India and China do. Hydroelectric is better than coal. If a place can get 100% of it’s energy from geothermal as Iceland does, then again, the need for nuclear/atomic energy is not there. But we must use atomic/nuclear energy when geothermal and hydroelectric are not available. Again those of us who support nuclear energy also support hydro-electric dams, geothermal, etc. and again, all the energies-nuclear/atomic, geothermal and hydroelectric must be used prudently. The main thing here is that we must save fossil fuels such as limiting natural gas to fuel cars and reduce coal usage. That’s why we must use nuclear/atomic power, geothermal and hydroelectric dams (when possible) combined.Nuclear/atomic energy has advanced -they already use less Uranium which lasts longer & more energy. Thorium needs to be perfect. Physicist Kirk F. Sorensen is working to perfect the Liquid Fluoride Thorium Reactor. In places which can get 100% of it’s energy from hydroelectric dams and geothermal, that must also be used. Nuclear/atomic power did have setbacks in Germany, Italy and Switzerland after Fukushima. Japan has been importing natural gas for energy since Fukushima. Patrick A. Moore criticized what Greenpeace calls a victory after Germany decided in 2011 to phase out nuclear. Germany is building many coal plants to replace their nuclear powerplants and importing gas. Germany will be getting dirtier air from their coal plants, but Greenpeace called it a victory. Austria in 1978 canceled it’s nuclear projects with Stop Zwentendorf and Austria has pollution. Windmills and solar (renewable energies) are old ideas, but as known they require more land, more materials and give less energy. Yes, wind and solar energies does have a role-renewable energies are again not green as it’s based on how much sun and wind you get and when renewables don’t give enough, then coal as Germany does is used. What happened in Japan in 2011 got the nuclear industry hostility– most of it unjustified. The earthquake forced nations to reevaluate their nuclear powerplants & some nations policies with Germany & Switzerland passing phaseouts & Italy refusing to reintroduce nuclear. Germany in the meantime has built or building more coal, buying more gas, so their energy policy is a joke. But the nuclear topic is not going away. India, China, U.K., Poland, etc. are building new nuclear powerplants. Whether people like it or not, nuclear energy toipic is not going away, just as BP did not go away after the 2010 spill. BP was negligent. It was condemned, got congressional hearings. BP’s business was hurt for a time, but BP is still in business. We need to build newer nuclear powerplants which are more advanced, better structures, etc. I agree with most of what you say, and there is no doubt that Nuclear plants can produce huge amounts energy. I only wanted to add a note of caution about seeing too much promise in nuclear produced energy. Its true that the Fukushima power plant’s radioactive breach happened as the result of something very unexpected like a Tsunami, but I believe when it was actually constructed it, as well as other nuclear power facilities in other parts of the world, were sold as being almost risk free—but when it comes to being (almost) risk free, this guarantee is not good enough—unfortunately (because of a nuclear plant’s enormous possibility to cause extreme damage to human life and the environment)—nuclear plants needs to be more than (almost) risk free! Also the many tons of radioactive wastes that are produced by nuclear plants need to be safely disposed of, and presents and unsolved problem about finding areas to dispose of it in. Since it can remains a risk for hundreds of thousands of year the constant stockpiling and building up of nuclear wastes presents a real problem for and the public, which is naturally concerned about radiation leaks. And, before expanding our nuclear facilities in america, we need to add safety measures which can deal with unforeseen problems like the Japanese Tsunami, since parts of our west coast, also experiences occasional Tsunamis–besides considering the problem of its potential high power earthquakes. And as I said the many tons of materials needed to build a Nuclear power plant and the manpower needed to build it plus the costs of transporting it, makes it not quite as desirable as wind and solar energy. These also require materials, labor and space, but in America we have plenty of windy areas, and uninhabited places where wind and solar plants can be built. I am not trying to say nuclear is not feasible, just that it too, has many drawbacks. As far as Thorium reactors go, I have heard some good things about them, including that they include designs that automatically flood fuel compartments in the event of a possible meltdown, and are therefore safer than Uranium or Plutonium facilitates. If their promise is found to be great, I hope our scientists and engineers will include them in future energy producing plans. About Iceland, they get large amounts of energy from geo-thermal sources because the island they are on contains numerous hot-springs and areas that naturally release heated steam. I don’t think many other areas have that luck, but that said, it is also certainly a promising solution–if not a total solution in other areas of the world also. With greenhouse gases, they are pollutants which are linked to breathing problems and can worsen breathing problems for those with asthma. Cleaning up pollution is a good thing. Whether or not greenhouse gases cause global warming, the fact that greenhouse gases are bad for breathing and the idea of cleaning up pollution is a good thing. We are better off w/o greenhouse gases and better off w/o pollution. esp. since the mid 2000s, more environmentalists are debating nuclear energy. Though the National Audubon Society has not promoted nuclear, they have published letters in Audubon Magazine by those (my guess Audubon members) who support nuclear/atomic energy & critique National Audubon Society for giving windmills too much credit. Sierra Club is corrupt. Sierra Club’s interest is $-Sierra Club took money from Clorox and put their logo in 2010 on Clorox Green Works-Clorox has had their problems with environmental violations see this http://yosemite.epa.gov/opa/admpress…c!OpenDocument. Sierra Club got criticism for their work with Clorox and while it was wrong-atleast they did not keep it a secret. Sierra Club taking millions of $ from Chesapeake Bay natural gas from 2007 to 2010 was however kept secret until it was disclosed in 2012. Sierra Club is corrupt and cares mainly about money and pushing agenda. We need to expand nuclear/atomic energy & we need focus on smaller reactors which can be put underground. Nuclear/atomic energy has advanced greatly -they already use less Uranium which lasts longer & more energy. Thorium needs to be perfect. Smart energy policy requires we use nuclear/atomic energy, hydroelectric and geothermal prudently. What is your background in climate science? How do you know that global warming is not caused by human activity? P.O.P., I am not a climatologist but have a friend who studied climatology and what I learned is by talking to him. I do not know if global warming is caused or not caused by human activity. My climatologist friend does not deny possibility that greenhouse gases raise temperatures but he also says that it could also be a natural event. He told me in 2006 that when the media discusses global warming, they tend to focus more on possibility that global warming is caused by human activity while not focusing as much on other possibilities. Earth’s temperature (be it Ice Age) has fluctuated throughout time-there have been hotter and colder times. During 1970s, many climatologists said that world was going into another ice age but since late 1980s they have been saying global warming. Certain things we know are not the result of greenhouse gases, We know that the Earth’s magnetic field has moved north, so there has been natural increase in temperature. But that does not deny possibility that greenhouse gases also increased global temperatures & it’s possible temperature change would be less if we did not have greenhouse gas emissions. As I have said P.O.P., whether or not man made global warming is happening, we are better off w/o pollution. We must build cars with better mileage and use cleaner fuels. Smart energy policy requires we use nuclear/atomic energy, hydroelectric and geothermal prudently. The main thing here is that we must save fossil fuels such as limiting natural gas to fuel cars and reduce coal usage. That’s why we must use nuclear/atomic power, geothermal and hydroelectric dams combined. All the energy sources including geothermal have their advantages and disadvantages. That is why we have environmental impact studies before a hydroelectric dam, nuclear powerplant, etc. is built and the engineers, physicists build according to this. When science advances that we can have cars which do not run on fossil fuels, then that is good. I am not an expert on global warming and yes, it is possible that greenhouse gases raise Earth’s temperature by adding to natural changes that have already happened. Yes, it is true that the oil industry hires those who deny man made global warming and who deny the dangers of greenhouse gases. But to me, the main thing again is that cleaning pollution is a good thing whether or not global warming is caused by greenhouse gases. Again, I am not a climatologist and my answer again is I do not know conclusively 1 way or other but believe that the right thing to do is clean pollution. After looking back at this thread from November of 2017, I think the most important point to make is about the mistaken notion that global warming is natural—and thus not primarilly man-made–however, no climate scientist is ignorant of the fact that natural variations in temperature have continually happened over thousands, or even tens of thousands, of years. When it comes to the reality of man made global warming though, the main problem is that, because of human Co2 emissions the RATE of warming is happening much, much faster than it has in millions of years–noticeably changing more rapidly (in decades or centuries) rather than over thousand of years! Thus, that rapid change leaves mankind and many other species very little time (in a evolutionary sense), to adjust to such rapid changes. So again, no climate scientists or those knowledgeable in the Earth Sciences, has ever suggested that climate has NOT always changed! However the paramount issue here is not the fact that climate change happens—it’s that our climate is now changing at a very rapid rate which coincides with the beginning of the industrial revolution and has increased steadily as human being continue to add more and more Co2 to the environment! Furthermore, this Co2 cannot be absorbed fast enough by conventional climate “sinks,” such as green plants and large oceans— which normally would serve to regulate our cycles of warming and cooling over thousands of years by absorbing Co2. In the case of green plants and trees, the fact is that our multi billions in human population are rapidly using up natural resources like trees to build housing etc. and therefore the buffer they would normally provide (and which would normally prevent our present extremely rapid temperature increases), is one reason that preserving our natural resources and recycling them is so important—determining whether we are ever going to stop, or even reduce, Co2 emissions! In addition green forests and green plants in general, absorb Co2 and release Oxygen as part of their natural cycle, thus benefiting us in several ways. The fragile ecosphere in which we all live, is normally fine-tuned, and thus can be altered by the most minuscule changes in normal cycles—just as only a few parts per million of Carbon Monoxide (which cannot even be smelled or seen) can cause humans to die quickly even from its very rarefied presence —think about it!